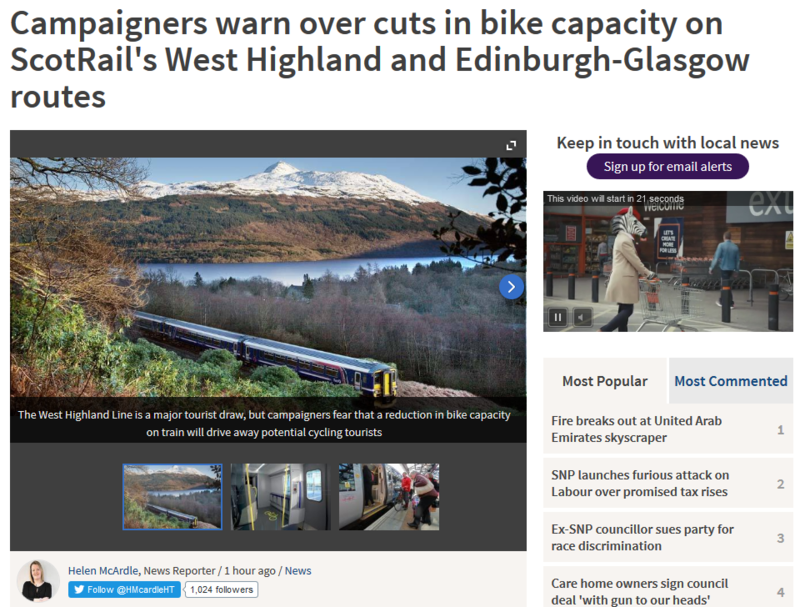 For the full story about severe cuts to West Highland bike/rail bookable capacity, and the bike storage downgrade on Edinburgh/Glasgow main line, see our original article, just a week ago. Click here for our tweet – see the current number of retweets and, if you agree with us, add your own!! It’s clearly time for the Transport Minister, Derek Mackay MSP, to have a re-think. If you have contacts in the West Highlands, inform them and ask them to make a fuss too – the tourism implications are considerable. For more bike/rail info, see our rail page. WHO IS BEHIND THE DECISION? Several people who commented on twitter blamed ScotRail, but in fact the main motivation lies with the Scottish Government and their transport agency, Transport Scotland. Transport Scotland wishes to maximise the seat-count headline numbers which get quoted in the press, even though this continues the ridiculous situation off-peak where it is hard to get on an otherwise lightly loaded train with a pram, push chair, bike, etc because of the lack of adequate flexible spaces – for which we unsuccessfully campaigned at any earlier stage. In addition to the huge retweet support, many people have commented, including the following. There are now many more tweeted comments, which we have not had time to add. @isleofeigg @DerekMackaySNP @Davytmsp V bad news for Small Isles tourism. No cars allowed on isles, so visitors bring bikes. Also similar tweet from @VisitSmallIsles. @researchdreams Really shocked by this. For health, tourism and sustainable travel we need more bike spaces on trains! @MikeRamsay4 @uartlach This seems to conflict with SNP environmental policies. Can you ask Transport Scotland to reconsider? @IslaAitken This is an utterly ridiculous policy. How do we encourage tourism and sustainable travel? @ZenBike_UK Cutting Active Travel space on trains doesn’t sit well with reducing Air Passenger Duty to encouraging tourism. @WhooshMTB Rubbish & a massive step backwards. A car-less biking trip up the West coast of Scotland is high up my to do list! @RobertaBuchan1 Thats a big cut! And on a line no doubt in high demand spring onwds! @ibikeEdinburgh NOOO! Stressful enough already bringing bikes on trains. Is brompton sponsoring this? @suzanne_meade This is not progress, long commute train/bike and tourist/leisure cycling adversely impacted! @Ken_J_Murray That’s rubbish. When I went Glasgow to Oban, they took 6 bikes & had to bus another 4 they’d overbooked. Need more spaces ! @ScotlandPhotos can’t begin to think what the motivation for this is!